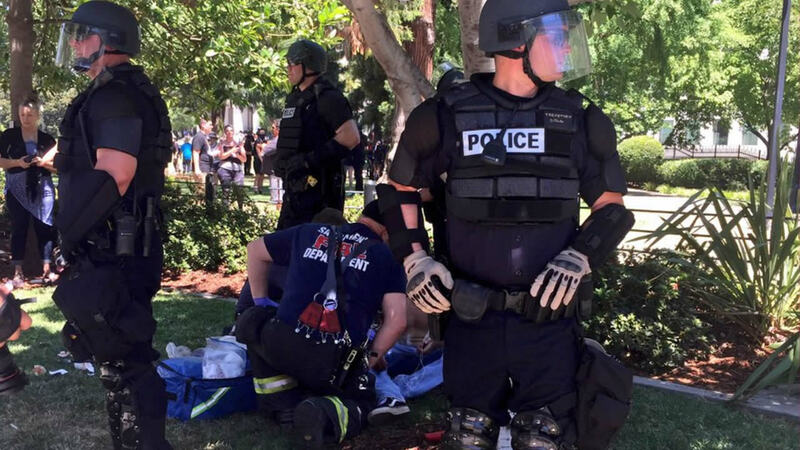 SACRAMENTO, CA -- At least six people were stabbed Sunday when members of right-wing extremists groups holding a rally outside the California state Capitol building in Sacramento clashed with counter-protesters, authorities said. Sacramento Fire Department spokesman Chris Harvey said emergency crews transported six people who were stabbed, some critically wounded, and that many other people had cuts, scrapes and bruises. "There was a large number of people carrying sticks and rushing to either get into the melee or see what was going on," Harvey said. California Highway Patrol officers managed to break up the large fight but some members of both groups remained in the area an hour after the fight first broke out, Harvey said. Videos from the melee posted on social media showed mounted police officers dispersing a group of mainly youth, some with their faces covered, while some throw stones toward a man holding a stick and being shielded by police officers in riot gear as he enters a glass building. The victims were all present while a protest took place, said Sacramento Police spokesman Matt McPhail but he said it was still unclear whether and how they were involved. The Traditionalist Workers Party had scheduled and received a permit to protest at noon Sunday in front of the Capitol. McPhail said a group showed up to demonstrate against them. The Southern Poverty Law Center has described TWP as a group formed in 2015 as the political wing of the Traditionalist Youth Network, which aims to "indoctrinate high school and college students into white nationalism." Matthew Heimbach, chairman of the Traditionalist Worker Party, told the Los Angeles Times that his group and the Golden State Skinheads organized the Sunday rally. Vice chairman Matt Parrott, who was not present at the Sacramento rally, said it was a peaceful march and blamed "leftist radicals" for instigating the violence. Heimbach said that in the clash, one of their marchers had been stabbed in an artery and six of the "anti-fascists" had also been stabbed. A message left at a phone number for the Traditionalist Worker Party was not immediately returned to The Associated Press. A post recently uploaded to site of the Traditionalist Youth Network said TWP members planned to march in Sacramento to protest against globalization and in defense of their right to free expression. They said they expected to be outnumbered 10-to-1 by counter-protesters. "We concluded that it was time to use this rally to make a statement about the precarious situation our race is in," the Traditionalist Youth Network statement said. "With our folk on the brink of becoming a disarmed, disengaged, and disenfranchised minority, the time to do something was yesterday!"